The simplest, yet most effective healing, protecting salve for combating the effects of the 4 unavoidable S-es: Sun, Smoke, Sugar & Stress. 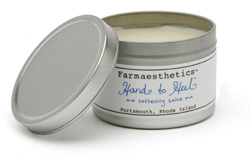 This calendula-based Hand to Heel Softening Salve protects and heals the effects of work, wear & tear, exposure to the elements, wounds & burns (even those produced by laser surgery), bruises & eczema (including childhood and nervous onset). Calendula is a heady resinous marigold flower, containing potent active healing constituents. Plus nature’s most unique compound, beeswax, which “science” in all its glory has yet to synthesize in its lab. Beeswax provides germ killing, protective barriers that lock in moisture. Lavender is added for its antiseptic, anti-inflammatory agents, as well as soothing scent & settling effect on the skin and nervous system. Peppermint & Beta Carotene add additional building blocks for tissue rejuvenation.